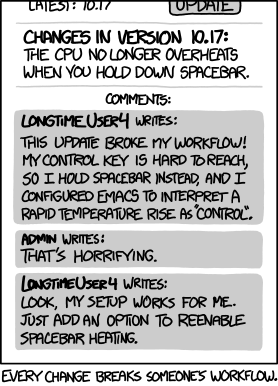 Our good old black taskbar will probably go away. Earlier the significant changes on the SO were later applied to the smaller SE sites as well (remember as the user pages were divided into two). I suspect many can think, maybe the SE Inc made a lot, much better developments as well, compared to this change. Particularly for mods, they have access to the mod chatroom. And probably brings with it customisable tabs (and I will certainly be complaining loudly if we don't). Now, I don't like the newfangled white theme, and some sites are going to be a agony in the donkey to do but this seems a bit hyperbolic. Should there be a list of tricky “off-topic” subjects for new posters to be directed to?